Do I need to be an attorney, CPA or an EA to use this software? No, you do not need a specific license to access the software. You will need to be a CPA , EA or attorney if you want to represent your client in front of the IRS. If not, your client will need to be present when you discuss issues with the IRS. Also, in order to download a clients transcripts you will need to either have them sign a Form 2848 Power of Attorney or Form 8821 Tax Information Authorization. Check the IRS instructions for these forms for more information. Can I import client data into IRS Solutions Software? Yes, we make it as easy as possible. You can import client data from another program that has been saved in a .csv file (comma delimited). Why would there be additional fees for something you need. There are no additional fees. We do not believe in nickel and diming our clients. We offer what you need so why would we charge extra for things like the transcript module. We treat our clients like we want to be treated. How much is IRS Solutions? Please see our Plans & Pricing page to find the plan that best meets your needs. While we don’t offer a free trial, you can try IRS Solutions with a risk-free, 60-day money back guarantee. You will receive a full refund if you cancel during this period. If you choose the monthly option you can cancel anytime with no contract. If you cancel before your billing date each month your credit card won’t be charged again for any subsequent months (refunds will not be issued if you do not cancel within 60 days). Please call or email us to let us know you wish to cancel so we can make sure your are issued a refund. Our servers were approved to be hosted on the Government Amazon Web Services Cloud (AWS Government Cloud). AWS GovCloud (US) is an AWS Region designed to address the specific regulatory needs of United States government agencies, education entities, and other customers and partners. The AWS GovCloud (US) Region has been issued a FedRAMP Agency ATO. All communications between your computers and our servers are secured with 256-bit Secure Sockets Layer (SSL) encryption. We use GlobalSign SSL Certificate the most secure option for SSL with the highest authentication and the strongest encryption. Yes, you can easily export all your data at any time. If you’re unhappy with the service, no hard feelings! You will be able to cancel your account at any time. We’ll do everything we can to make the transition away from our application a pleasant one. Remember our goal is to have you treated as we would like to be treated. How do I download this software to my computer? IRS Solutions is a web-based, hosted service. There is no need to download anything this software is licensed to you. If you have Multi-User license all users under the same license can login simultaneously. If you have a Single-User License only 1 person can login at a time. You can upgrade at any time to a multi-User license. Simply call our office and we will assist you through these steps. We want to make sure you do not lose any data. Yes, all our letters allow you to put your Logo and firm information in. And you can edit and customize them for each client. Is the software available in Spanish? Yes, the software has been translated to Spanish including the input screens, letters, IRS notices and when available the IRS Forms. What is the IRS Notice Advisor Tool? Imagine your client calling you in a panic stating that they just got a letter from the evil IRS. You being the calm and cool accountant that you are ask the client to read you the number off of that notice and while you are on the phone with them you simply type the notice number into our system. You will instantaneously have a sample of that letter, a simple explanation of the letter as well as the necessary steps to help that client out. You can easily say “Mr. Client, this notice is for <fill in the blank>, I have seen this notice before and we can help you. The first step will be… “ This client is sure that you can help them and they are more than happy to pay your bill. How does the IRS Transcript Analyzer work? This easy tool allows you to Request IRS Transcripts in minutes using your e-Services account and instantly receive not only your clients IRS transcripts but a detailed Summary report that will extract the important information from the transcript removing all the “gobbly goop” that is not important. This is not only handy for you to start working your cases but there is also a nifty print out so you can keep your clients in the loop and they can see where they stand with the IRS. What if I input a Form 433-A and decide to do an offer in compromise? This is one of the reasons this software was built. One day David had completed a 10 page Form 433-A and then, with the help of the client, decided to submit an offer in compromise. He was using one of the other softwares but he still had to re-input all of the data again. ALL 10 PAGES. He knew there was a better way so IRS Solutions Software was born. Can I make money if we offer Audit Protection? Audit Protection is a service you can offer your current tax return clients. You can choose what is included and what the price is. The idea is that not all clients will get audited each year, and you can use the money to make up for the tasks you are doing for clients for free. Thus allowing you to charge the clients that opt out of the additional fee when they come to you with an IRS notice, Audit or other project. We have all seen scope creep and this can help you limit it. Many accountants find they don’t have to do any additional work as they are already doing things for free. And 1 member made an additional $85k in one year. I have never done this before. How would I know what to offer the IRS? IRS Solutions Software has the intelligence written into the software to help the accountant present the choices to their client. In most IRS collection cases there are only 3 options: Offer in Compromise (OIC), Installment Agreement (IA) or Currently Not Collectible (CNC). Based on the accountants input the software will analyze all options for you. I don’t do tax resolution. Why would I want this? Many of our members have not done tax resolution before joining and still do not do “tax resolution”. The program was designed to be easy to use and help you the tax professional learn how to help your clients and tax office become more efficient when dealing with the IRS. The tools save hours of work each week for our members, including downloading IRS transcripts, responding to IRS notices and other time-sucking tasks the IRS has delegated to us. Our OIC calculator follows the rules of the Internal Revenue Manual. It gives a quick and dirty representation of a likely outcome. Offer in Compromise is all about the details and we never guarantee they will be approved, but we can help skew the odds in your favor. Having the tips and tricks at your fingertips will help you avoid the mistakes many make when submitting an OIC. Can I access the software on my mobile or tablet? Yes, the system is web based and can be accessed anywhere you have internet access. Your eyes don’t recommend using your phone but it can be done. And the system is built for use on a tablet or computer. Do you have the forms for Offer in Compromise? Yes, whether you are helping an individual or business client we got you covered. We have both the Form 433 series forms and the 656, and we keep them up to date. What if I do not have letter that I am going by and the client just needs help? We have a tool for that. Just let Agent Dave know what the issue is and he will assist you through the steps of what is needed to bring your case to a resolution. How does your Notice Advisor work? When you or your client receive a notice or letter from the IRS, IRS Solutions will provide you with a sample copy of the Notice or Letter by simply typing in the Notice number ie CP2000. This tool also provides all of the step by step guidelines for getting the IRS the things that they need and help you not waste time on the things they don’t want. How easy is it to populate the forms? All forms are driven by input questions. The great thing about this is we ask most questions in plain English, no need to be a Rhodes Scholar when IRS Solutions is around. All forms are populating in the background and the software will let you know which ones you will need. You simply follow the instructions and print the necessary forms out and Wala! I am thinking of purchasing this software. What forms are included with this product? IRS Solutions has all of the common (and some uncommon) Forms needed for IRS collection and audit issues. Our forms library includes: 433-A, 433-A (OIC), 433-F, 433-B, 433-B (OIC), 656, 12509, 12153, 9465, 911, 2848, 8821 and many, many more. If you don’t see it, let us know. I can request IRS transcripts for free directly from the IRS. Why is this different using IRS Solutions Software? IRS Solutions Software is all about making it easy. We give you the ability to streamline the process of requesting and give you a simple report of the important information that is easy to understand and easy to read. Why would I want these IRS transcripts? When reviewing an IRS transcript you can find out so much about your client including: Current Tax Liabilities, Penalties & Interest, Filed/Unfiled Tax Returns, Federal Tax Liens, Collection Status, estimated Collection Statute Expiration Date (CSED) Calculations, Earliest Dates for Bankruptcy Dischargeability, First Time Penalty Abatement eligibility, Account Transcript and Payment Summary. What transcripts can IRS Solutions Software pull? A client portal is an electronic gateway to a collection of digital files, services, and information, accessible over the Internet through a web browser. This will allow your clients to share information with you, the accountant, through a secure online portal branded with your own logo or photo, and streamline the document exchange process between tax practitioner and a client that saves time and saves trees. 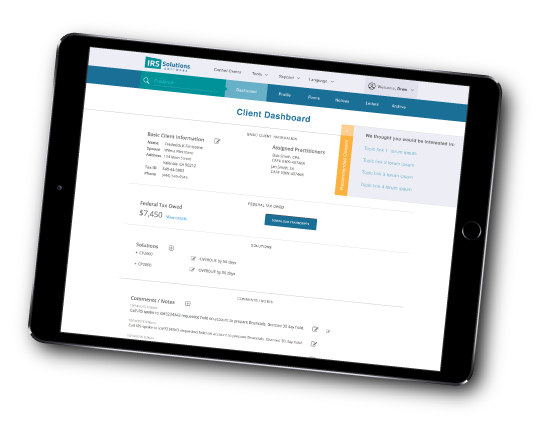 Using this portal will also allow your client to complete the financial statement on their own, cutting down on 100’s of questions. And don’t forget, everything is done through our secure Amazon Government cloud. Do you charge extra for your client portal? Why would we charge extra for the things that you need? We treat our clients the way we want to be treated. All necessary tools that we offer are included with your subscription.